You can always count on us to provide you the top quality ink cartridges with super low prices. Our high quality Canon PG-245XL compatible black ink cartridge and CL-246XL compatible color ink cartridge are an economical option to the expensive OEM Canon PG-245XL and CL-246XL ink cartridges. 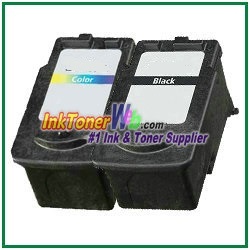 The use of compatible replacement ink cartridges and supplies will not void your printer’s warranty. By purchasing from us, not only will you get the same quality print outs, you get to save money on your printing needs as our prices are much lower compared to OEM cartridges. All our remanufactured ink cartridges contain at least as much ink as the original manufacturer products, so no matter which kind of printer you have, you can be assured to reduce your printing costs. You can find Canon PG-245XL compatible black ink cartridge sold separately for a sale price of $21.45 and Canon CL-246XL compatible color ink cartridge for only $23.45 each. These Canon PG-245XL and CL-246XL compatible ink cartridges also come in a 2 piece combo set for $42.95, or a 3 piece combo set for $62.50 which includes one color ink cartridge and two black ink cartridges. If you go through these ink cartridges fast, you can check out our other combo sets here for these compatible ink cartridges and stock up. If your order total is greater than $50, you save even more with our free shipping service within US. If you need assistance with your order, please contact us by email or phone at 1-877-288-7969, and we will gladly help you.